Thanks to Sophia, I have some photographs from the inaugural Sandcliffe Writers Festival which you can see in the blog above. You can find out who the people in them are by clicking on the red comment tab. 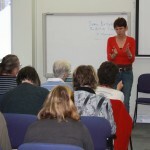 The day started with two excellent seminars, courtesy of the Queensland Writers Centre. Kristina Olsson introduced us to the process of writing memoirs, illustrating her points from her own discovery of a lost brother, the child her mother had with her first husband. It’s a heartbreaking story, but one which, no doubt, everyone in that class will want to read. I cannot wait to read “Boy, Lost” myself, and confidently recommend it to others, knowing what a fine writer Kristina always is. Megan McGrath presented the next session, entitled “Blogging and Author Platform.” Once again, I have heard nothing but high praise for this part of the festival. I know many of us have been inspired to seriously apply ourselves, now, to the blogosphere. 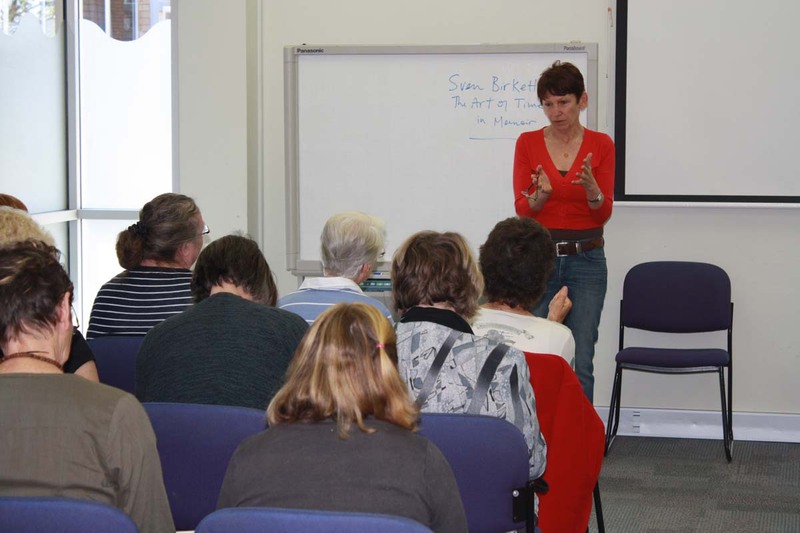 We had 44 audience members in these two sessions, in a room which normally accommodates no more than 30. When they realised that more bodies could be reasonably comfortably added to the quota of 30, the librarians from Bracken Ridge rang a number of people who had missed out on being included, but were in reserve in case the first to book a space couldn’t make it to the presentations. Bless their hearts. We were so well looked after by the folks from the Bracken Ridge library, we can only say thank you, thank you, and thank you again. Let’s do it next year, too, guys. 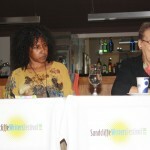 The rest of the festival was held in the Seaview Hotel in Shorncliffe. After an inspirational, and the most moving Welcome to Country I have ever heard, from the redoubtable Sam Watson, a man I have admired for many years, the Yulu Burri Ba Indigenous dance troupe beguiled and bedazzled us. 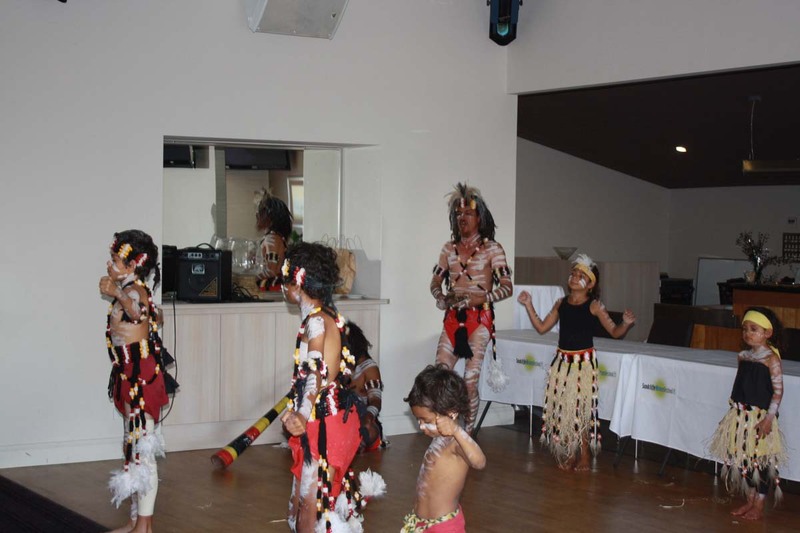 These gorgeous people are all descendants of revered Elder, Oodgeroo Noonuccal, the famous poet and Aboriginal activist who starred in the first suburban Writers Weekend in Queensland (also held at Shorncliffe) in 1992, presented by the Society of Women Writers, Queensland, who auspiced Sandcliffe, in 2013. 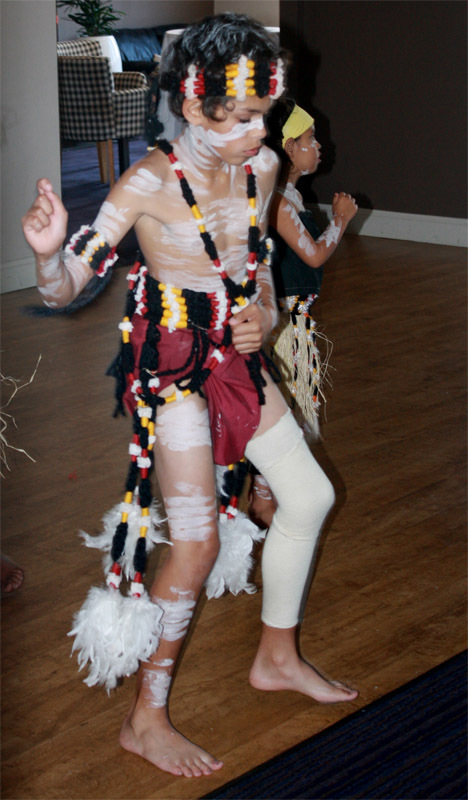 As Sibelco Australia sponsored the dance troupe, we thank the North Stradbroke Island company for their part in our festival. It was sheer delight. 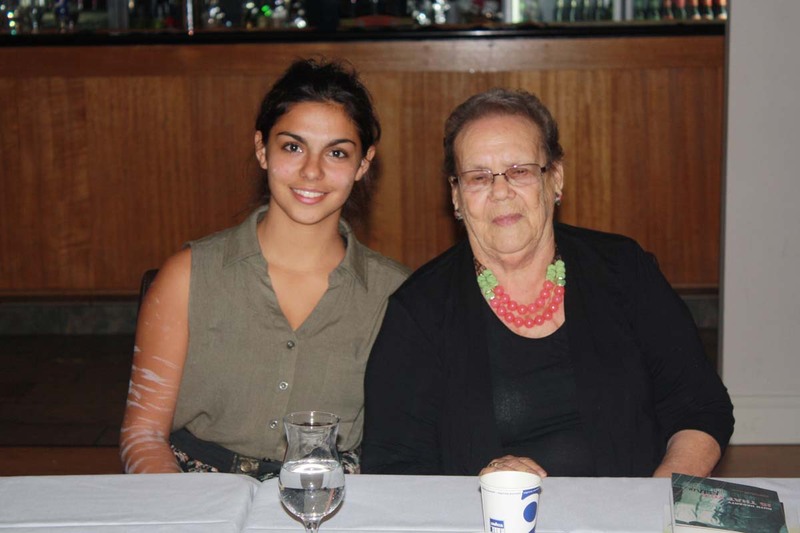 Next on the program were six Indigenous writers in two panels, introduced and convened by a very talented young lady, Rhianna Patrick, who works at the ABC when not helping out at Writers festivals. (This was her first festival, but no doubt, never her last.) 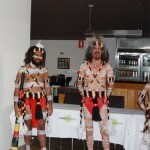 Aboriginal Men’s Stories gave us an insight into Indigenous lives and the struggles our Original Owners have had over two centuries just maintaining a place in their own world, through Sam Watson’s incisive account. 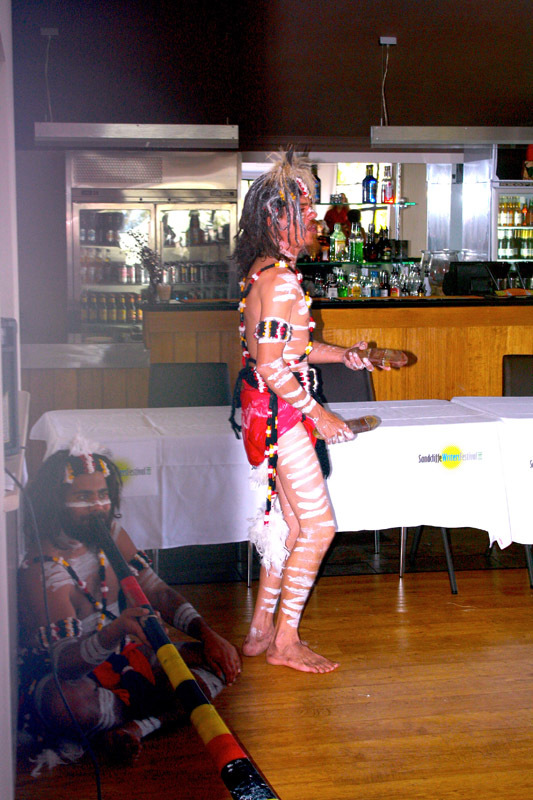 Joshua Walker, (one of Oodgeroo’s grandsons) still wearing the body paint he wore as the songman and a dancer with Yulu Burri Ba, told us about the intricacies of Skin, the ingenious laws governing the intermarriage of his people right across the nation. 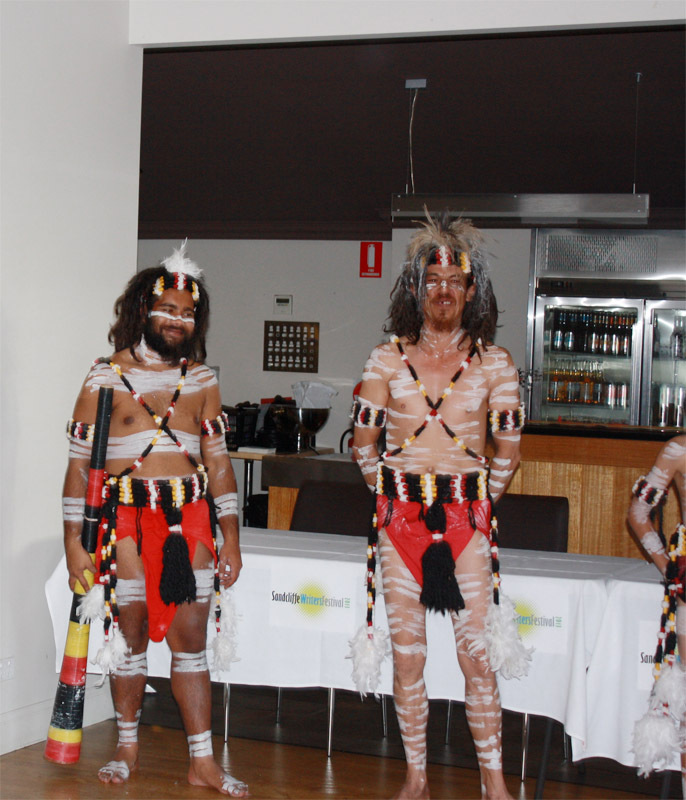 He also explained some of the social mores of the Australian Aboriginal people, which, no doubt, made some audience members nostalgic for better family organisation within the white community, which would sustain us as they have sustained our black brothers and sisters. 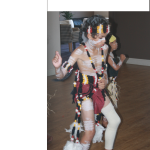 My fervent hope is that Joshua will write all of the fascinating information he gave us on Saturday, into a book, for we really need to know a lot more about the Indigenous way if we have any intention of preserving the planet and indeed, our family structures. Sam Wagan Watson, award-winning poet and raconteur, next wowed us with a selection of his poems. This man is extraordinary, his work among the best of contemporary Australian poetry. I intend to read everything Sam Watson Jr has written and has had published, and will report back to you on this blog. 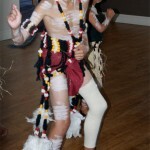 The Aboriginal Men’s stories were followed by Aboriginal Women’s stories. Aunty Ruth Hegarty, a much-loved local Elder, spoke about how her life was the source for all of the books she has written. She read short excerpts of her published works as did the next speaker, Sue McPherson. Sue’s book “Grace Beside Me” had the audience in stitches. I intend to read and review these writers’ books on this blog, so watch this space. Last but not least, was Elizabeth Engelbrecht. 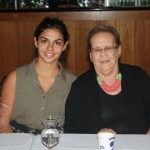 She told us about her work as the curator of the Oodgeroo collection in the North Stradbroke Island Museum, and repeated three potent words from her great-grandmother, regarding racism: “Don’t hate, educate.” Sadly, Elizabeth never actually heard her great-grandmother say these words, as Oodgeroo died before her lovely great-granddaughter was born. 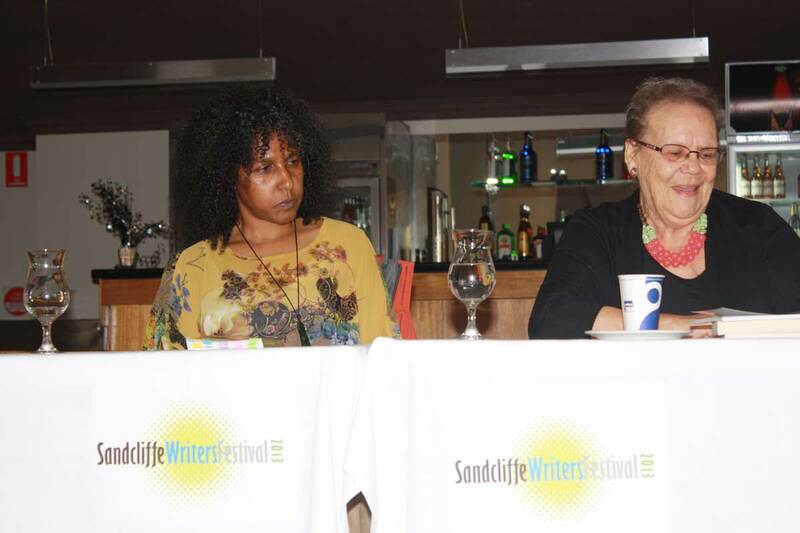 However the spirit of Oodgeroo was with us at the Sandcliffe Writers Festival, as was the spirit of Eunice Watson, Sam Snr’s mother, and another potent woman whose life touched many of ours—black and white alike. Both of these extraordinary women would indeed be extremely proud of the people who have followed in their footsteps. After a dinner break, we filed back into the Events room of the Seaview hotel for the Open Microphone session, which was an opportunity for our local writers. We had some excellent work presented, but were let down, to some extent, by a dodgy microphone. Four people objected to a political poem and stormed out, which goes to show you can’t please all of the people all of the time (even if you wanted to). Apart from these malcontents, however, we have had nothing but praise, so it might now be time for Adele and myself to go back to the drawing board for the 2014 Sandcliffe Writers Festival. Many thanks are also due to the Lord Mayor’s Suburban Initiative Fund for the wherewithal to allow us to present the festival without having to charge any admission fees. 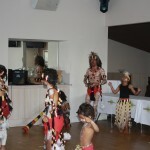 Many people have graciously mentioned the fact that they appreciated that the workshops, dance troupe and panels of writers were free of charge. We couldn’t have done it without our sponsors and the added help of the wonderful BCC Library Services, QWC, FAWQ and the SWWQ. May the Muses always lighten your lives. 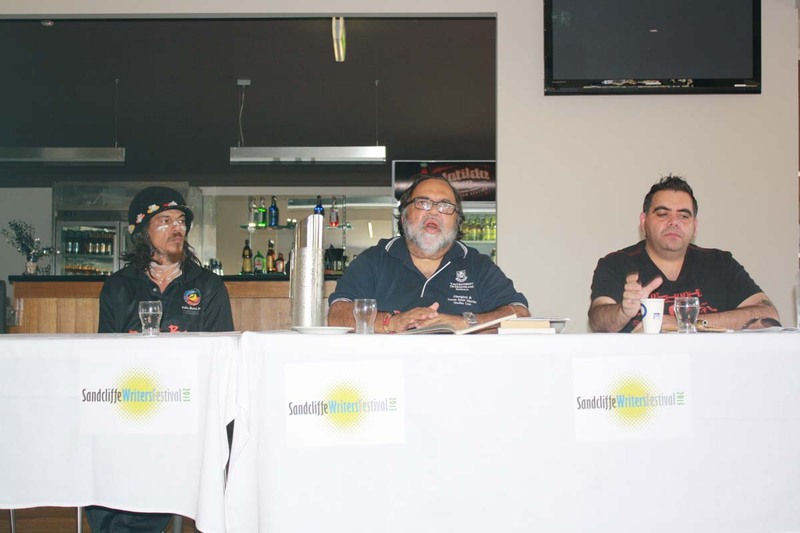 The Inaugural Sandcliffe Writers Festival. Congratulations to Sandgate Rick and Emma King from the Brighton Writers for reading at the Open Microphone session of the inaugural Sandcliffe Writers Festival —and in fact, for all those other courageous souls who had never read their work in public before. You did extremely well. The festival was such a success we are seriously considering presenting another in 2014. There are some excellent photographs which I’d like to share with you, and as soon as I have gone through them all I will post my favourites. These would include portraits of some of the dancers from the spectacular Yulu Burri Ba Indigenous dance troupe, and snaps of the panelists who enlightened and entertained us. 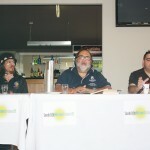 The panels presenting Aboriginal Men’s and Women’s stories gave us such diversity and wealth of anecdote and wisdom, I am astonished that schools have not tried to tap into the wellspring of the knowledge our Indigenous Elders carry around with them. Wake up Australia, learning to view the world through the eyes of another culture, many thousands of years older than our own, may just save us from environmental, and indeed, social disaster.